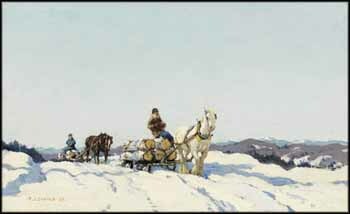 After 1914, the horse-drawn sleighs used in winter by farmers, woodcutters and ice haulers in the Laurentians and Quebec's Eastern Townships became the dominant subject in Frederick Coburn's oeuvre. Seen through his studio window in the town of Upper Melbourne, a team of horses hauling a sledge laden with logs from a sawmill at Kingsbury had struck Coburn like a revelation. In Winter, Hauling Wood, men drive logging sledges through the open countryside, enjoying an expansive view of the Laurentian Mountains. One of the elements distinguishing this work is the brightness of the winter day - light streams from the unclouded sky, illuminating the snow and casting cool blue shadows. Coburn often used the motif of one brown and one white horse hauling a sledge together; here they work with separate loads. He was known for his fine painting techniques developed while studying in Berlin, Munich, Paris and Antwerp, and Coburn's sensitive rendering of the landscape and feeling for the working people of Quebec are both clearly evident in this outstanding example of the subject for which he was renowned.